With the release of Your Future, Our Clutter, The Fall marks 33 years of recording with another stellar disc. The music has evolved over that time, from proto-punk to a more poppy tunefulness to electronica and new noise – and the line up has changed time and again. But at the centre of the group always lies mastermind Mark E. Smith. He has famously declared, ‘If it’s me and your granny on bongos, it’s still The Fall.’ Some 40 or more folks have cycled in and out of the band over the years, as Dave Simpson has chronicled. But Smith is right: it always sounds like The Fall. There’s an absolute certainty in his vision that can put some people off. Smith has at times been notoriously difficult with interviewers and journalists, and at times cheekily proud of the fact. ‘The Observer magazine just about sums him up, e.g. self-satisfied, smug,’ he sings in ‘How I Wrote Elastic Man’, itself a song written to express his annoyance with people’s failure to read the materials, as he clearly sings ‘How I wrote Plastic Man,’ a reference to the comic book hero. 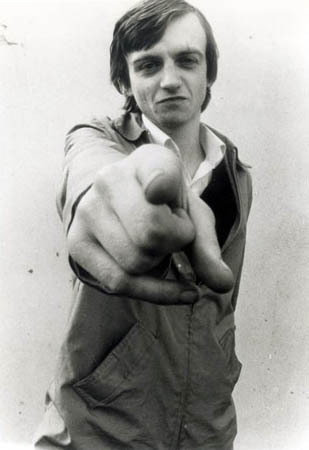 The Fall’s music has influenced bands and artists (see his Tate Modern interview) but Smith insists on maintaining the picture of himself as just another working stiff. When an academic conference on The Fall took place in 2008 at the University of Salford, Smith’s relatives buttonholed presenters at the pub, demanding to know who authorized it, and Smith later called former Fall producer Grant Showbiz in the middle of his presentation. Read the rest at The Spectator Medium and hey, leave a comment! I’m knee deep in work today. Resurfacing later — I hope.